1368-1372 74635-2, ?? 9/74, -- Nee DRGW 3117, ?? 1463-64, 66 & 69-70 38558, 37846, 31771, -- 7, 8/71 & 5/66, -- Nee C&O 4078, WP 3535 & SAL 604, & ?? 2013, 14 & 15 74609-45, -- -- 2/74, ?? 2038, 44, 46, 47 7334-26, -- ?? 1/72, -- ?? 2209-2214 847028-60, 56-58, 55 & 59 5/86 Ex-UP 6059, 6055-57, 6054 & 6058; #2213 & 2233 are "SD62s"
SD70AH-T4C (EMD) 8997-9061 20146115-1 to 065 3/16-8/16 #9026 repainted as 1943 "Spirit of the Union Pacific"
UP calls these units "GP22T4" will be built from the following core GP38-2s: 282, 623, 639, 645, 717, 721, 806, 808, & 841. Note: New PS4A/B & PS6B model classifications were applied to mother-slug combinations to better rationalize slug designations. It looks like all of the PS model changes were started in June 2016. UP 1720 < UP ???? UP 1723 < UP ???? #1603 and 1606 are "snoots"
Data Source for above tables is Sean Graham-White. A special thanks to Sean Graham-White whose monthly UPRR updates on LocoNotes has been extremely helpful in maintaining this roster. 1) C45ACCTE are UP's model designation of GE ES44AC locomotives, which feature Controlled Tractive Effort. 2) C44ACCTE are UP's model designation of GE AC4400CW locomotives, which feature Controlled Tractive Effort. 3) C44AC are UP's model designation of GE AC4400CW locomotives without Controlled Tractive Effort. 4) C44ACCA are the AC6000CW's that were actually built as 6000 HP locomotives with Deutz engines, and then later downgraded to 4400 HP with 16 cylinder FDL engines. They also have different computer and electronic control systems. 5) C44/60AC are UP's model designation of GE AC6000CW locomotives which were built as "convertibles". They were delivered with the standard 16 cylinder FDL engine with later plans for repowering with 6000hp engines, which never	happened and thus remain as delivered with 4400hp FDL engines. 6) C44ACM are UP's model designation of a modernizing program the UP and GE are testing currently on some older AC's. Upgrades are to be all electrical, and the existing prime movers are to be retained. None have left GE at Erie. 7) GP38N, GP40N, SD40N, MP15N and GP15N units feature NEXSYS III-i microprocessor-based locomotive control system, which features a reliable and compact design, increased locomotive adhesion, advanced control options and	integrated AESS technology that will significantly extend the life of the locomotive. 8) SD70AH are UP's SD70ACe locomotives that are ballasted an extra 4 tons, and weighs 428,000 pounds instead of the normal 420,000 pounds for regular SD70ACe locomotives. 9) C45AH are UP's model designation of GE ET44AC locomotives. 10) PS6B is a slug. 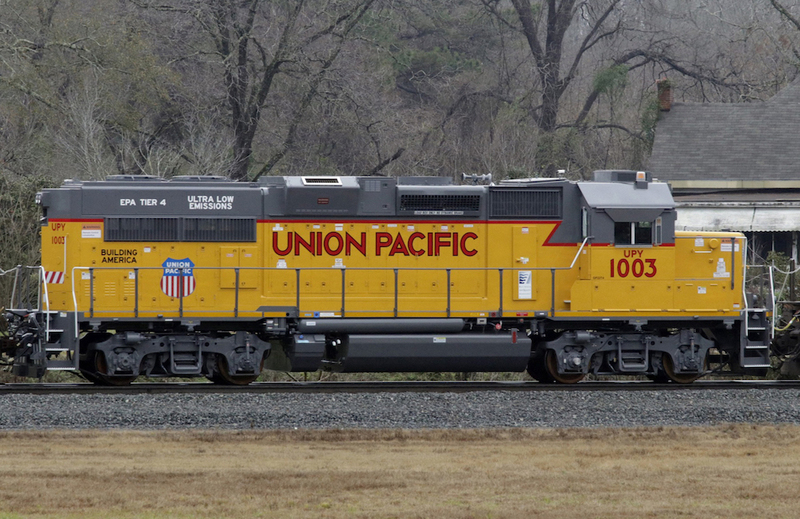 They are built from former SD38-2 units (the UPY 800-867 series) and are mated to the SD40N units in the UPY 300 series. There is to be 50 "mother-slug" sets in total when the project is complete. Other update sources/contributors: Leo Ames, Scott Arentzen, Tom Boylan, Martin Baumann, Marty Bernard, Mark Bridgwater, Buddy Burton, Bruno Burzins (via LocoNotes), Bob Campbell, David Croteau, Shane Darst, Fred Drayton, Chris Edmonds, Michael Andrew Falconer, Wesley David Fane, Lim Fish, Tom Fassett, Mark Glos, Mark Gorney, Billy Hager, Daniel Hanna, Steve Hardin, Mike Harbour, Kingston Harrier, Erech Hazen, Tom Helliwell, Billy Hunter, John Gabriel Ibay, Joe Kahan, Jerry Krug, Carl Lehman, Jeff Miller, Curt McCullough, Kerry McKerrow, David Mitchell, Kristing Moore, David Nickson, Joe O'Mara, John Owens, Derek Pinsonat, Jack Prange II, Jacob Rajlich, John Poshopeny, Mike O'Conner, Martin Oksnevad, Jacob Petersen, Jacob Rajlich, Larry Rathjen, John Roamer, Kevin Sadowski, Rob Sarberenyl, Mike Schattl, Aaron Schlegel, Mark Scott, John Stewart, Paul Surguy, Lynn Thomas, Scott Thomas, Craig Walker, Ed Weisensel, D. Hunter Williams, and Jon Yamada,, and Kevin Zettelmeier. Via LocoNotes: Jeff Thoreson, Kevin DeGroff, Tony Johnson, Chris Keating, Ken Larson, Paul Surguy, and Don Strack. Major roster updates/expansions were completed with the aid of Michael Richmond.